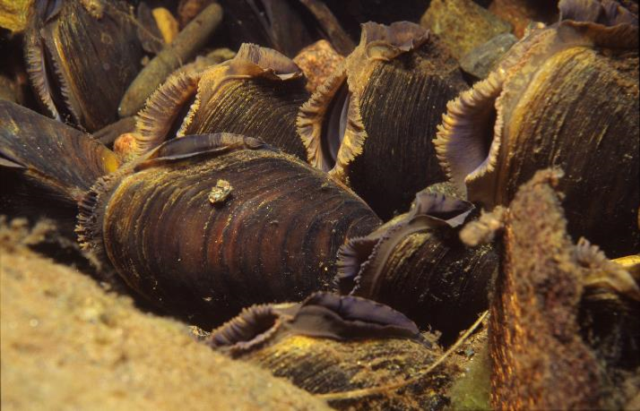 The freshwater pearl mussel (FPM) is one of the longest-lived invertebrates and can on average live to 130 years of age and grow up to 155mm in length. It is found in rivers that have a bed of coarse sand and fine gravel with water that is clean, cool, fast flowing and free from pollutants. Here they live buried or party buried within the river bed holding themselves in place using their muscular ‘foot’ which also allows them to move albeit slowly. An adult mussel will filter around 50 litres per day filtering out tiny organic particles to feed on. The FPM as a bivalve mollusc, has its body almost completely enclosed between a pair of shells hinged together. The outer shell is generally yellowish-brown in colour, darkening with age, and the inner surface, the mantle, is pearl white. The mantle protects the soft parts of the mussel from any parasites that get into the shell, by growing over them and covering them. Interestingly the Irt population is considered to have a slightly differing shell shape to other populations of freshwater pearl mussels. Unfortunately there is no information available on the population to demonstrate if this difference is also genetic. FPM are typically dioecious (separate sexes), with males releasing sperm into the water column in June-July; the female inhales the sperm and fertilises the eggs. Between July and September the female releases one to four million tiny (approximately 0.6-0.7 mm) larvae, called glochidia, into the water column. 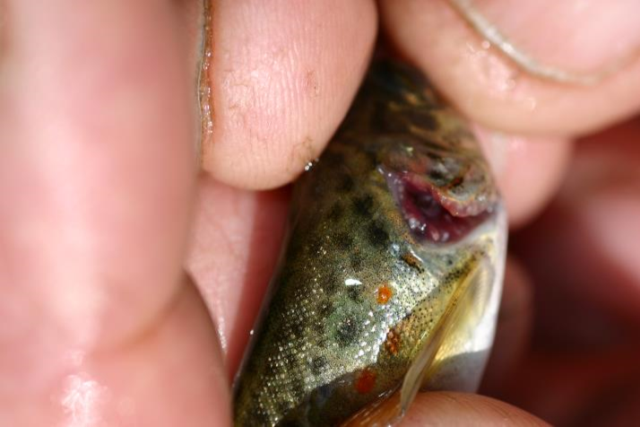 Glochidia require a juvenile (fry) salmonid (Atlantic salmon (Salmo salar) or trout (Salmo trutta)) fish host for the next stage of their development. The preferred salmonid host in the River Irt is Atlantic salmon although they have been observed upon trout. The tiny shells of the glochidia are held open until they are inhaled by the host, then snap shut on the host’s gill filaments. Glochidia become encysted within the gill tissue (see photo on left) and grow in this oxygen-rich environment until the following spring, when they drop off. These juvenile mussels must land and burrow into clean, sandy or gravelly substrates in order to settle and start to grow. The river bed of the River Irt is choked with silt meaning that juvenile mussels cannot survive as they suffocate. This is because too much soil is being washed off land in the catchment and into the river. The association between mussels and fish does not appear to harm the fish, and is beneficial to mussels as it facilitates mussel dispersal. Due to the essential role salmonid fish play in the life of the FPM, the conservation of salmonids is also central to the survival of this endangered species. Mussels reach sexual maturity between 10 and 15 years of age, by which time they will be typically 6.5 cm in length. It is thought adult mussels do not have an upper age limit for reproductive activity and continue to reproduce until they die. As the FPM population in the River Irt shows no evidence of successful reproduction and is at risk of extinction, the Freshwater Biological Association (FBA) in partnership with the Environment Agency and Natural England relocated some mussels to an ‘ark’ site. This is to help ensure that if the population is lost from the wild the genetic makeup of the Irt population will not be lost forever. 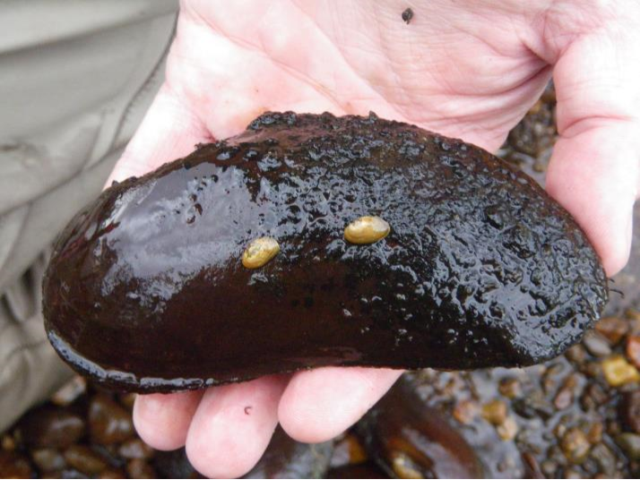 Additionally the FBA have had good success with captive breeding of mussels. Juvenile mussels from the Irt cohort are planned to be translocated from the FBA into an area of suitable habitat within the catchment during 2017. In preparation for this the juveniles have been toughening up in a flume which is set up to mimic conditions expected to be encountered in the reintroduction site.